Snuck off to the river the other day and caught 3 rainbow and a perch. I tossed them all back, was just in the mood to fish and didn't really want any for dinner. Caught them all on a Little Cleo, although I used a few other spinners like Rooster Tail and a Daredevil, but Miss Cleo was the choice of the day. I used my ultra light tackle with my 40 year old Zebco Cardinal 3. My rod is a new one...sort of. Its a 20 year old Fenwick! LOL! I do buy new line every year though. This time I picked up some Trilene XT in 6lb test. I have all kinds of new stuff, but I seem to stick with the old stuff. Crazy ain't it? Nice going, bo! And as far as old good stuff, it works and lasts for a long time. You seem to be a fella that takes good care of stuff. How far do you have to travel to trout fish? You folks had a great time and well deserved! I took last week off work and caught a few catfish and found about 2 1/2 pounds of morel mushrooms. The first channel cat I caught weighed 5 1/2 pounds. It grabbed the nightcrawler as soon as it hit the water. Darned nasty trout are every ware. Sounds like a good outing. I've been fortunate that the Swedish made Cardinal series Zebcos of the 70's are still popular enough to find parts for them, although I really haven't had to get many things. I have a Cardinal 3, two Cardinal 4's and a Cardinal 6. The Cardinal 6 I use only when I head to Florida or waters that I use heavy line and live shiners. That has become a rarity for me, so the Cardinal 6 is still in about 98% condition. My Cardinal 3 and both of my Cardinal 4's are about 85 to 90% condition but they have seen more action. The 3 is my go to trout reel and both of my 4's are used for bass, and I primarily fish plastic worms and jigs with them. The only negative comment I can make about all of these reels is that the screw that attaches the bail to the actual reels has fallen off all four of the reels on different occasions. There is or was a company that sold replacement parts for those reels, so back around 2000, I ordered 12 screws and springs for the different models. I'm down 10 screws but still have all 12 springs. I figure I should be okay for another 30 years or so! Atlanta is about as far south as you can find trout. The water is just too warm once you get passed the northern outskirts of the city. I fished a stretch of the Chattahoochee that is part of National Park and is stocked pretty regularly. The part I fish is artificial only, and that keeps the number of fishermen down, but the ones who do show up tend to be fly fishermen with their 6 million dollar Orvis bamboo fly rods, and they can be a pompous bunch of wimps. I've had to put a few in their places over the years. One year right after I was able to start walking after my rehab from Afghanistan, I promised to rip one guys head off and go ca-ca down his neck. About three times after that if he saw me coming he would get in his BMW and leave. Haven't seen him for many moons, so he either left the area or decided to find a more conducive place to fish. 100 trout in five days! Looks like you tore them up Bill. I've trout fished in Virginia, but never West Virginia. I'd sure like to though. Seems they're kinda' like Georgia in they stock their areas too. In some places here the trout are reproducing, but not nearly enough to maintain a viable fishery, so the state restocks in some areas and on private property people can stock waters too. Of course BC is not that far from West Virginia, but you can't get him to go fishing, I swear! Don't know what we should do with that guy!? Very nice D! 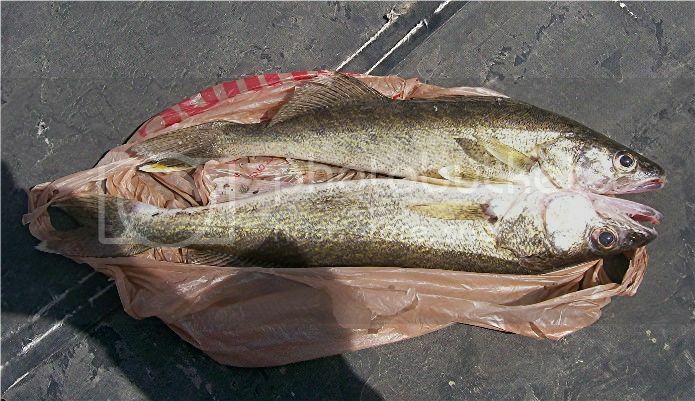 There are very few places in Georgia that have walleye. I've caught them is Arkansas and South Dakota, and they are a fighting fish. Tasty too! We have a lot of walleye here. The Mississippi River is packed with them. My normal way for fishing for them is trolling with cheaply priced Wallydivers. Boat motor is still waiting for its tune-up before it hits the water. It is really dangerous to be on the river without a motor that will start. My old boat is an 18' jonboat with a Coast Guard bow and pushes along via an old but good 35HP Evenrude. The motor will throttle down to the right walleye trolling speed, unlike most motors around here. Sometimes catfish and drum hit the lures, but not often. A fella never has too much fishing gear. I have at least 5 or 6 of each color of Wallydivers. If you fish and only have one or two of a certain color the fish are hitting that day, you risk losing them in snags and your day of productive fishing is done. The best color I have used for big walleyes is the black/silver lure. What's really nice, the river is right out my front door, just down over the bluff. And that part of the river is our best walleye fishing. Our part of the river has a lot of sunken wingdams where the fish hang out. I troll over the wingdams with the lure bumping the rocks. Three fishermen in my boat is about the max if only trolling. If the lure snags, slack is given and the lure floats free 99% of the time. It is actually rare when a lure is lost. Wallydivers are floaters that dive while in motion.